The YM-5 is a portable permanent magnetic yoke designed with hinged arms and rotating pole pieces to allow a wide variety of test part profiles to be magnetized, while the specially shaped pole pieces permit easy removal from the component for cleaning. It provides a portable and convenient method of magnetizing components for magnetic particle inspection flaw detection with no power supply needed. 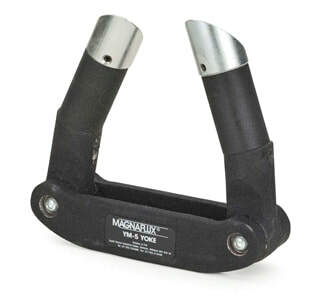 The YM-5 is supplied with a keeper bar, which includes an artificial flaw to verification of magnetic strength. The field strength of the YM-5 with pole tips in contact is greater than 7,000 Gauss, and it features 40-pound dead-weight lift strength.